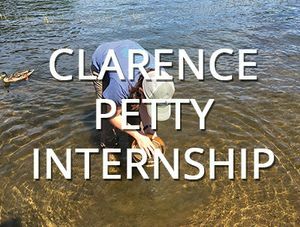 The Clarence Petty Internship Program was launched in 2002, with the program being named in Clarence Petty's honor and a fund established at the Adirondack Foundation to provide support for young professionals interested in the environmental field for years to come. The Adirondack Council hosts college and graduate student interns in our main office in Elizabethtown in the Adirondack Park and in our government and communications office in the State Capital of Albany. The Adirondack Council is committed to offering interns an experience that will prepare them for employment in an environmental non-profit, government agency, or related field by working alongside professionals at a nationally recognized conservation organization. Clarence Petty Internship Program alumni have found jobs with state and federal government agencies and other environmental organizations. Former interns have become full time members of the Council's program team. Others have continued with graduate study in public policy and pursued environmental law degrees. In return, the Adirondack Council has benefited from their enthusiasm and fresh perspective to challenges facing the Park. At the same time, we pleased to be training a new generation of environmental leaders.